2. Add the walnuts and toast for 3 to 4 minutes. 3. Mix the yogurt, mayonnaise, lemon juice, dijon mustard and thyme leaves in a bowl. 5. Add the chicken cubes, toasted walnuts and diced apples. 7. Add salt and black pepper powder. 8. Mix again until well combined. 9. To make the wrap, place 1 lettuce leaf on a wrap bread. 10. Spoon about 1 cup of the chicken mixture on the lettuce leaf. 11. Fold about an inch over each end of the filling and then roll up to serve. 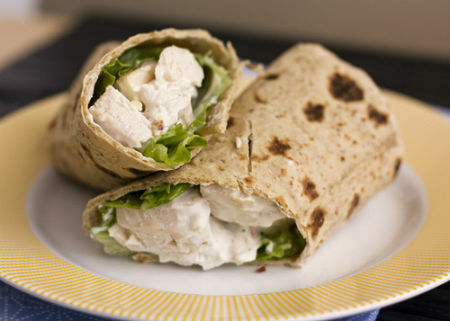 Feel free to comment or share your thoughts on this Waldorf Chicken Wrap Recipe from Awesome Cuisine.